To complement our secondary machining capabilities we have several High Speed Broaching machines. High Speed Broaches use a flat blade type cutter to produce flats or slots on a work piece. By combining this technology with an indexing fixture we can rapidly generate hexagons, squares, rectangles and a variety of shapes in almost any material. This process is particularly effective on low carbon steels and cold headed parts where milling tends to cause burrs to form on the work piece. 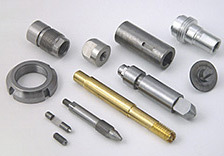 If you are presently using a milling machine to generate wrench flats, screwdriver slots or other shapes on your product, give Ohio Metal Products the opportunity to quote broaching. Our High Speed Broaching Service can lower your manufacturing costs and give your company a competitive advantage. Our customer service team will work closely with you to establish an ordering arrangement that is most beneficial to you. We accept blanket orders as well as supporting Kanban and just-in-time delivery systems. To learn more about our High Speed Broaching Services, please review the table below, or contact us directly. 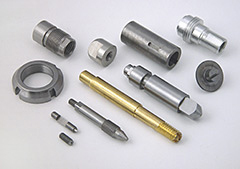 We would be pleased to evaluate your part to determine if it is a good candidate for broaching.